Payments as low as $107/mo. Or, apply & pay as little as $107/mo. We’ve been working with Michael Tuttle since 2010 and can’t get enough of his quality, consistency, level of detail and the passion he puts into his instruments. His Tuned T 500 series with flame maple tops were built to commemorate his 500th build. He planned on building a limited run of 5 and we ordered 6. Michael’s guitars are nothing but superb and we can’t wait to celebrate serial number 1000. 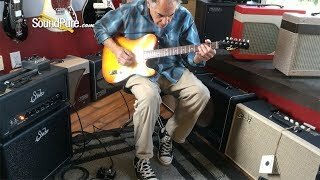 In this video, Sound Pure electric guitar specialist Eddie Berman plays the Michael Tuttle Tuned T Ice Tea Burst Electric #500-C through a Suhr Bella Reverb 1x12 Combo Guitar Amplifier with a Strymon El Capistan dTape Delay Effect Pedal and a Xact Tone Solutions Imperial Overdrive Guitar Pedal. 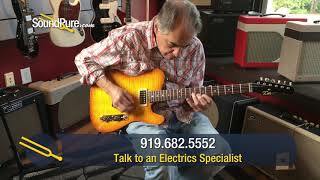 In this video, Sound Pure electric guitar specialist Eddie Berman plays the Michael Tuttle Tuned T Ice Tea Burst Electric #500-C through a Suhr 2017 Badger 18 Amp Head with a Strymon El Capistan dTape Delay Effect Pedal and a Xact Tone Solutions Imperial Overdrive Guitar Pedal. For the past two decades, Michael Tuttle has specialized in the fine art of what it takes to make a piece of wood feel good. Michael makes the necks feel like they're a part of your hands from the moment you pick them up. Michael Tuttle's background includes stints with Valley Arts and Don Grosh Guitars, where, among other things, he gained a reputation for his fretwork. As a guitar player for the last 30 years, the transition from a professional musician to guitar builder has been a valuable asset to his company. He built his first guitar in the early 80's and in 1993 started building guitars commercially. After 10 years of honing the art of guitar building working for other organizations, it was time to start out on his own. Michael Tuttle Guitars began in 2003. His unique craftsmanship and quality are unparalleled. Once you've played a Tuttle you'll know!